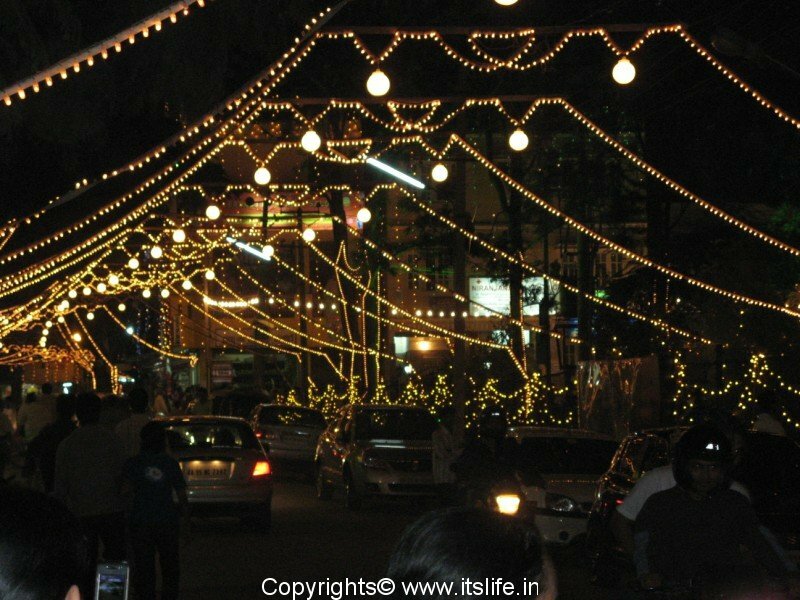 In Mysore, we always looked forward to Dasara, which is the Nada Habba (festival of Karnataka state) and it is not only celebrated in homes but the whole city seems to wake up from the slumber to 10 days of grand festivities, color, doll arrangements, tasty snacks and lights. The hospitality of Mysore is at its best with most of the houses warmly welcoming guests to be a part of the heritage celebrations. Dasara or Dussehra or Navrathri (‘Nav’ meaning 9 and ‘rathri’ meaning night) is celebrated all over India and Nepal for 10 days. It is called as “Dashain” in Nepal. 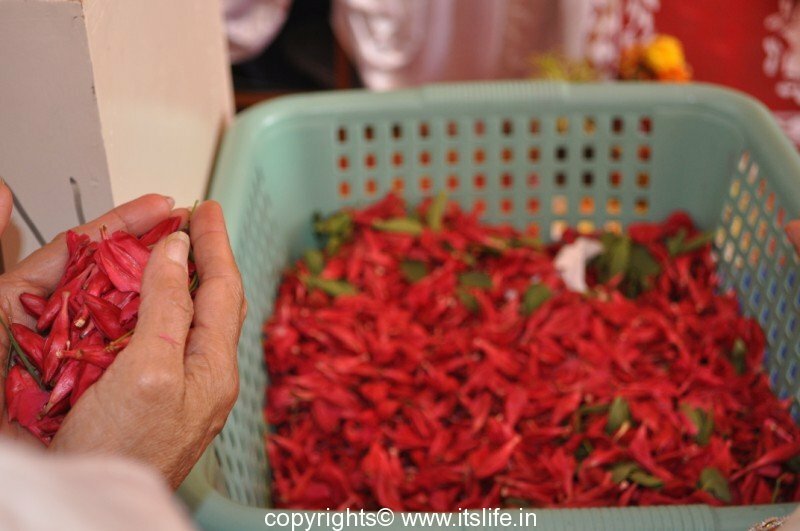 This festival falls on Padya, which is the first day of the Hindu month “Ashwayuja also known as Ashwina”. September – October in Gregorian Calendar. The festival concludes royally on the 10th day i.e., Vijayadashami (‘Vijaya’ means to win and ‘Dashami’ means 10). Each day is celebrated with different rituals in different parts of the country. This year (2017) the festival starts on 21st September. Legend narrates that Goddess Chamundeshwari vanquished the demon in Mysore City situated in Karnataka during the Dasara period. Hence Mysore was named as Mahishapura before the Britisher’s anglicized the name to Mysore now renamed as Mysooru. There is a beautiful temple dedicated to Chamundeshwari on top of Chamundi Hills in Mysore. 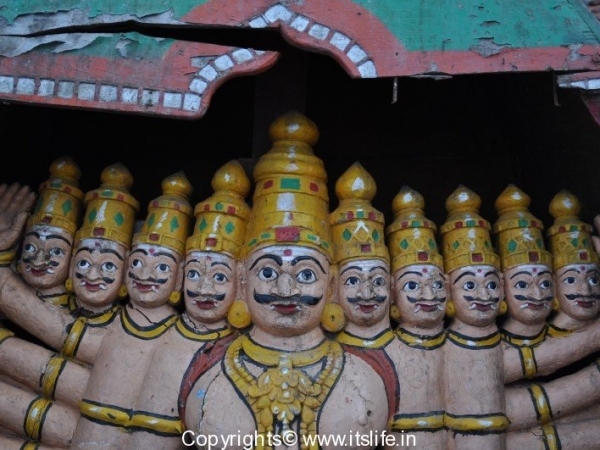 The legend of this region narrates that Lord Rama killed Ravana the ten-headed demon king of Lanka on this day. 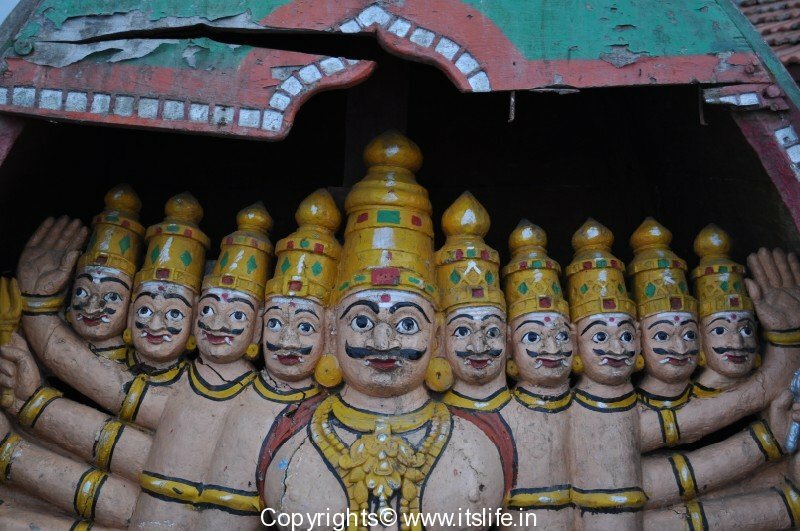 Hence, on Vijayadashami 3 huge effigies of the demons Ravana, Kumbhakaran and Meghanad measuring up to 50 feet is built and stuffed with firecrackers. In the evening 2 Men dressed as Rama and Lakshmana shoot fire arrows at the effigy and it goes up in flames busting crackers. People rejoice this scene and make merry going around Melas/Fairs. They also watch the Ramlila (a dance drama of the epic Ramayana) with rapt attention. 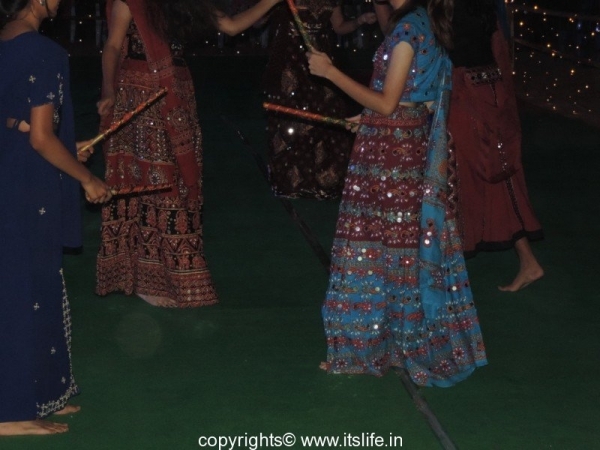 Gujratis celebrate Dasara with special pooja, Dandiya dances and Garba. Dandiya and Garba are the traditional dance of the Gujrat region, where men and women dress in traditional and colorful costumes and dance in-groups. 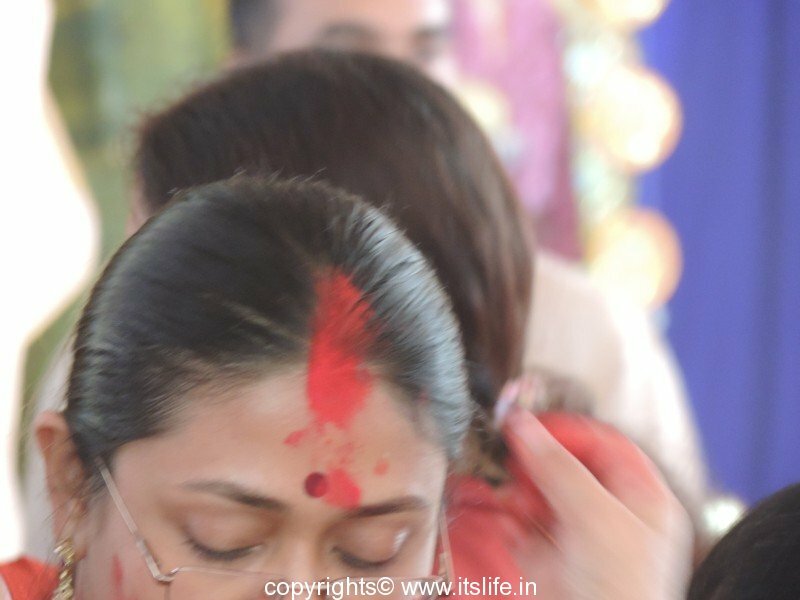 Before they start the dance, the aarathi ritual to Mother Ambe is offered with the whole group singing songs in praise of the mother. Dandiya and Garba usually start around 9:00 p.m and winds up around midnight with feasting. In East India especially in Bengal, Durga Puja, which starts on the fifth day is the biggest festival. It is the festival to commemorate the triumph of Good over Evil. Community celebrations are very common and huge idols of Durga slaying Mahishasura are installed in colorful pendals (marquee). In the evenings people around that place come together to enjoy musical and cultural evenings. The last day of the festival is known as Dasara or Vijayadashami. Legend of this region report that goddess Durga is visiting her mother’s house situated in the Himalayas. During the festival people buy new clothes and prepare festive meals. The meal comprises of Luchi/Poori (deep-fried bread), Aloor Dum (potato side dish), Khichuri (mixed vegetables dish), Labra (mixed vegetables dish), Cholar Dal (Curry), Baigan Bhaja (Crispy Eggplant roundels) and Payesh (pudding). 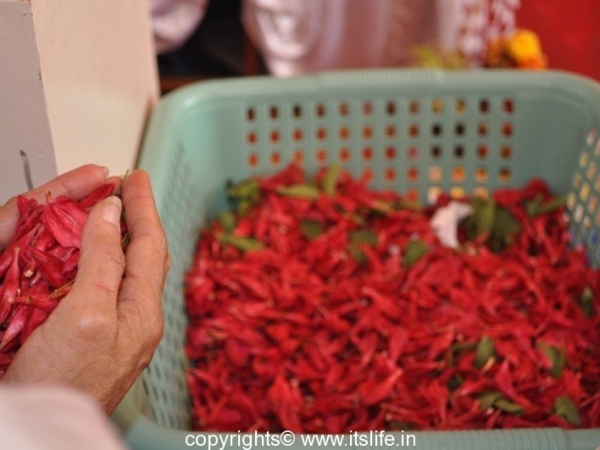 The festivities include the Maha Pushpanjali (offering of fragrant flowers). On Ashtami in the evening after an elaborate aarthi, young men perform ‘Dhunuchi nritya/ a form of dance to the sounds of drums. 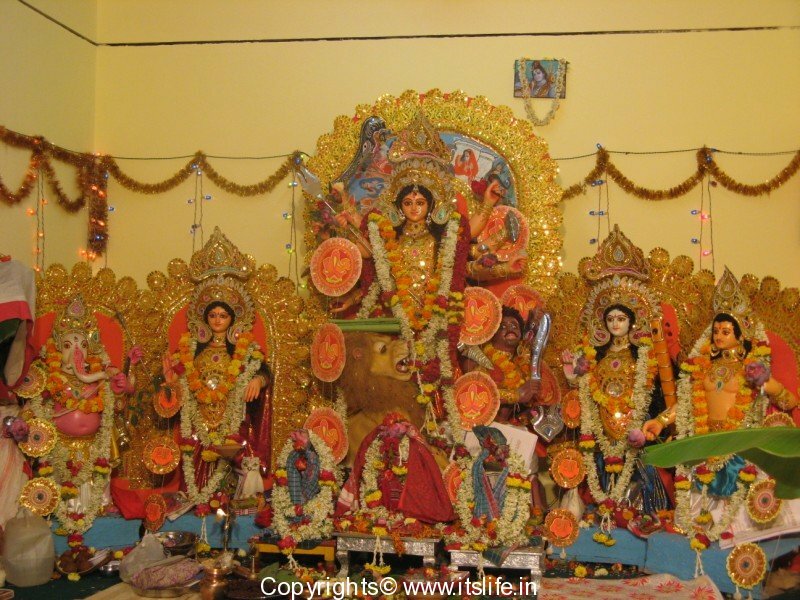 On Vijayadashami day as a send off to the goddess people celebrate with music and revelry. 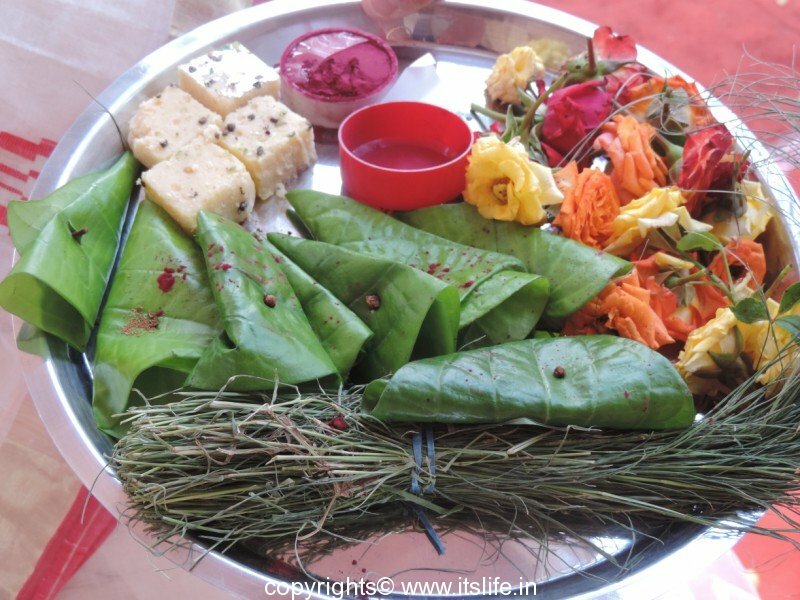 Married women with a plate filled with betel leaves, sweets, flowers, sindoor (kumkum) first offer these to the goddess and then apply Kumkum/vermilion colored powdered on each other known as Sindoor Khela before the Durga idol is taken in a procession for visarjan/immersion in rivers or ponds. It is believed that she will reach the Himalayas after the visarjan (immersion of the idol in water). 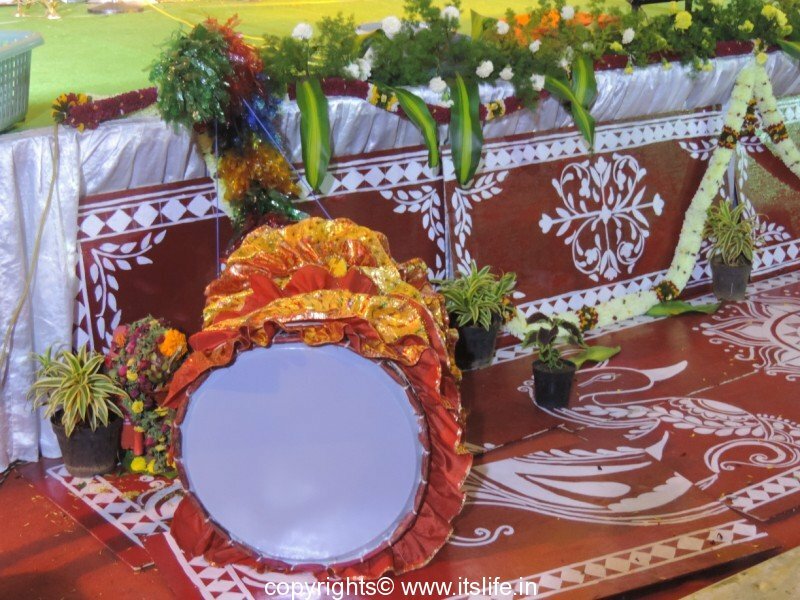 In this part of the country in some houses, there is a custom of ghatasthapane/pot installation for the duration of the festival. On the first day a silk cloth is spread on a mandasana (pedestal) and the idols of gods are installed on it after the abhishekha (bathing of the idols) is performed. 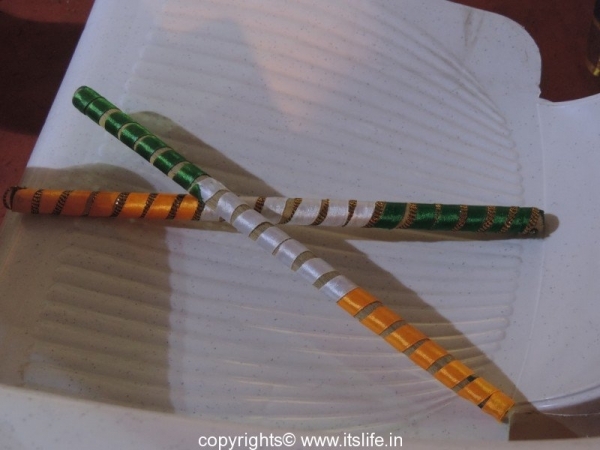 One lamp lit with ghee and another lit with oil constantly burns throughout the 9 days of festivities. 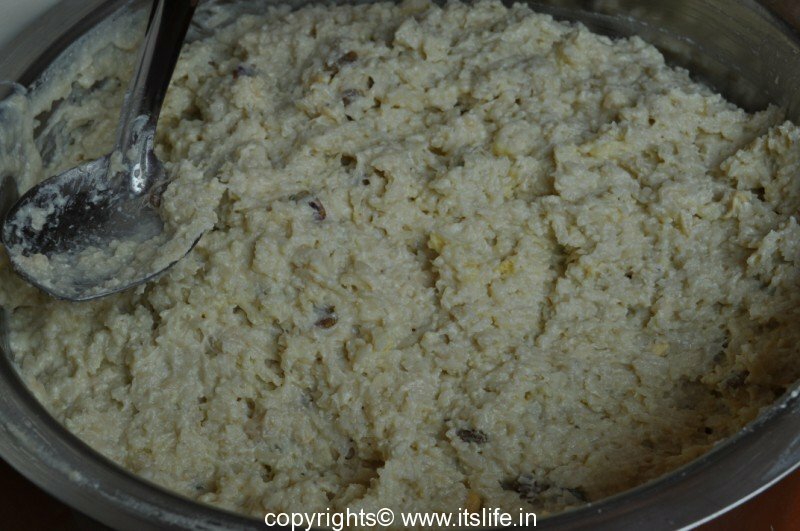 A habbada adige/feast is prepared on all the 10 days comprising of Payasa (sweet pudding), 2 Kosambari, Tovve, 2 Palya, Huranada Holige (sweet bread) and 1 Chitranna, which can be either Lemon Rice, Kayi Sasve or Puliyogare (tamarind rice) etc., and offered to god along with elaborate aarthi and worshipping of gods. Houses in Mysore and Bangalore district arrange gombe/dolls in the house aslo known as Kolu/Golu by Tamilians. To represent the maharajahs/kings rose wood dolls of the king and queen are kept on top with a kalash (a small vessel made of silver or copper filled with water and betel leaves arranged over it). 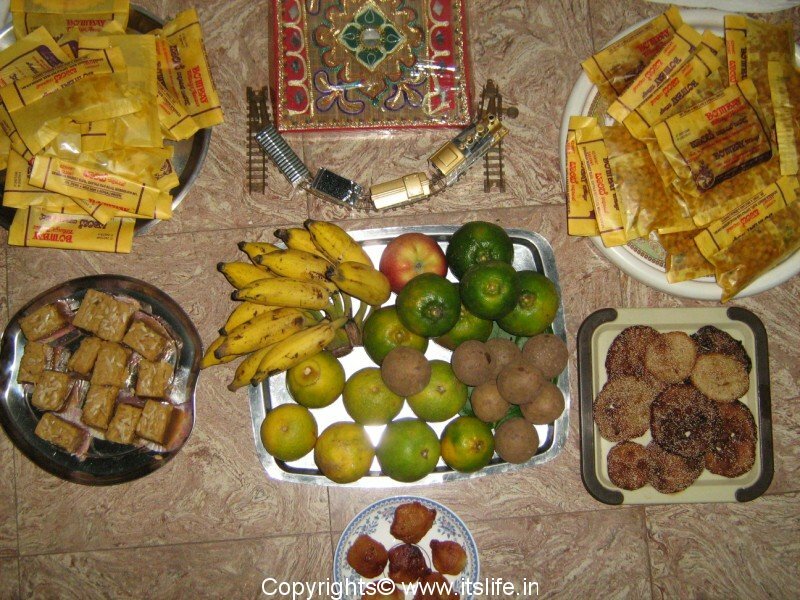 In the evenings special aarthi is performed to the gombe and children’s favorite sweets and savories are prepared like Khobbari Mithai/Coconut Burfi, Nippattu, Kodabale, Chakkali, Khara Sev, Besan Laddoo, Rava Laddoo etc., and distributed among the neighborhood kids. It is known as gombe bagana. 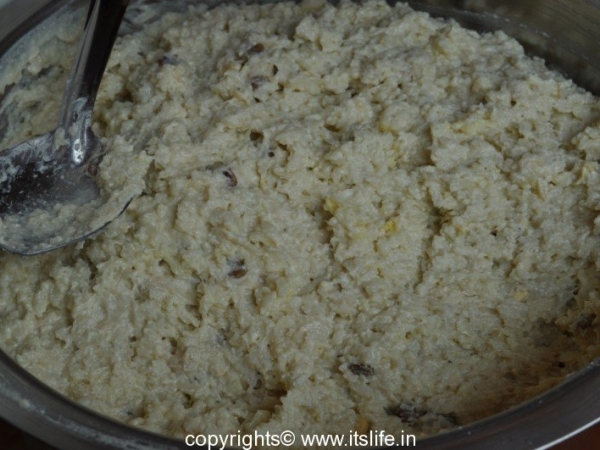 On Sapthami, the 7th day Saraswathi the goddess of learning is worshiped with special offerings like Usli/Gugri (a dish prepared using black gram) and Yeriappa (a sweet dish). 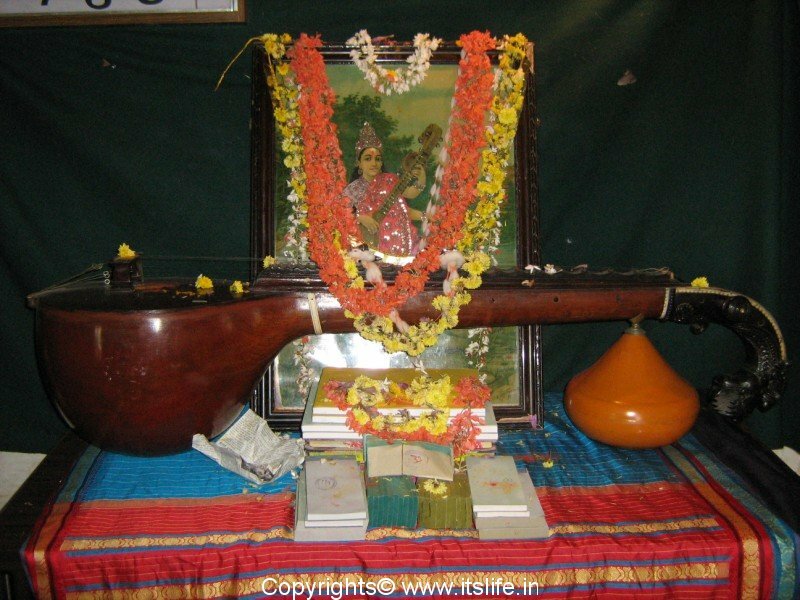 Books, Pens and musical instruments are also worshiped on this day. The next day is ashtami, the 8th day, which is Durgashtami, on this day Ambode/a deep fried crispy lentil based fritters is offered to the goddess. She is shakthiroopini kathyayini (goddess of power) and special prayers are offered to her. The rathothsava (carriage ceremony) of Chamundeswari on Chamundi Hills in Mysore is extremely grand. Lakhs of people amass to witness it and feel blessed. 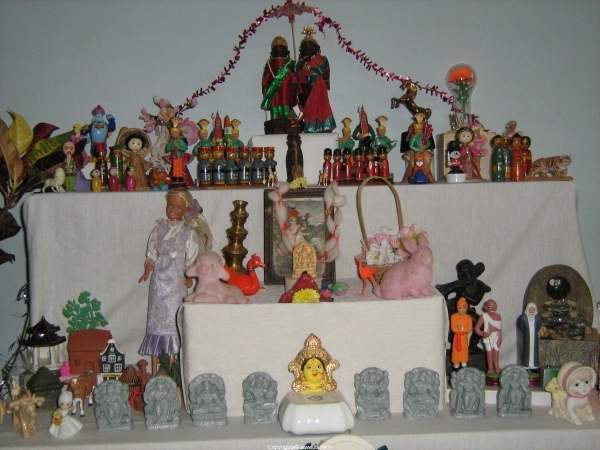 Ninth day is Mahanavami/Ayudha pooja. On this day vehicles and weapons if any are worshiped. Habbada adige/feast is prepared. The tenth day is Vijyadashami/Dasara. On this day the Banni tree is worshipped and people in North Karnataka exchange Banni leaves and greet everyone. In Mysore it is the grandest day of the year. The city is synonymous with Dasara festival (Mysore Dasara) and the Mysore Dasara procession is world-renowned. His Highness Srikantadatta Narasimharaja Wodiyar the scion of Mysore will commence the festival performing the pooja of the Nandi dwaja. An idol of goddess Chamundeshwari is placed inside the beautiful Golden Ambari (elephant-mounted throne) in the Mysore Palace and taken in a procession, into the city to reach Bannimantapa (a place with the sacred tree Banni/Shami). The Pattada Ane (royal elephant), Pattada Kudare (royal horse), royal band in the band carriage, the silver carriage, the state symbol ganda berunda (two headed eagle), music, folk dance, tableaux are all part of the procession. People from all over the country and other countries congregate to witness the splendors of a bygone era. In the evening a torch light parade is held, with military and the police taking part in a disciplined manner showcasing their dare devil skills on horses and bikes. They also perform a drill holding torches and hence the name. The festivities end with a grand display of fireworks. 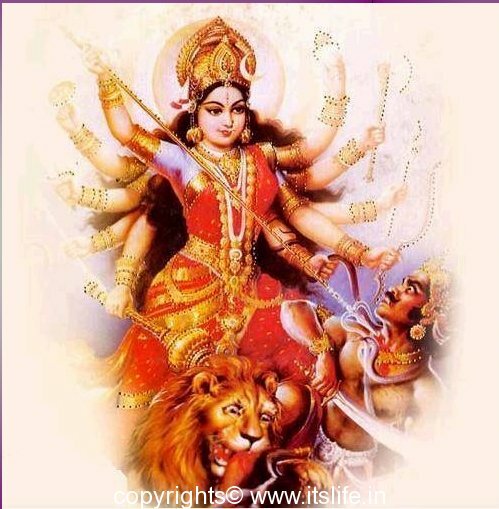 .I want to know about goddess lalitha tripurasundari and sri chakra pooja done at home ,can someone help me please? Please inquire in any of the Shankara Mutta’s for the information. You also get books on these subjects sold in Raghavendra Swami Mutta or in Shankara Mutta. Thank you Shantha , for the time and information but i live in Austin,tx,USA. I follow all the festivals ,i am found of devi and wanted to preform pooja to her, if you have any information about the above, please pass it over . Mamatha, I will let you know if I come across information regarding your query. I know the simple pooja rituals and for special poojas I invite priests over to perform them. 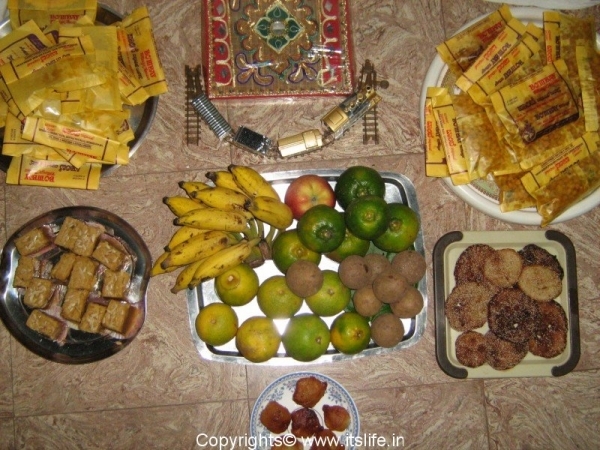 Daseera is much awaited celebration after 9 days long fasting n pooja. celebrated to worship devi who protects with our ayuddh. Thank you Ashwini for pointing it out. Have corrected the same.